The Ancient Egyptian God with the head of a Jackal, Anubis presided over embalming, funerals, and was guide of the deceased here in an amazing bust. 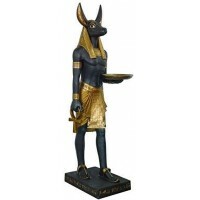 This stunning bronze resin bust statue of Anubis is 9 3/8 inches tall with hand painted color detail with pedestal base accented by a winged Scarab. Item Number: UI-WU76649A4 | Approximate Size (Inches): 4.00 wide x 3.50 deep x 9.50 high | Approximate Shipping Weight: 3.00 lbs.